I'll be 100% honest. I know ZERO about Minecraft, but when your best friend's son requests a theme, you google it and get down to business. 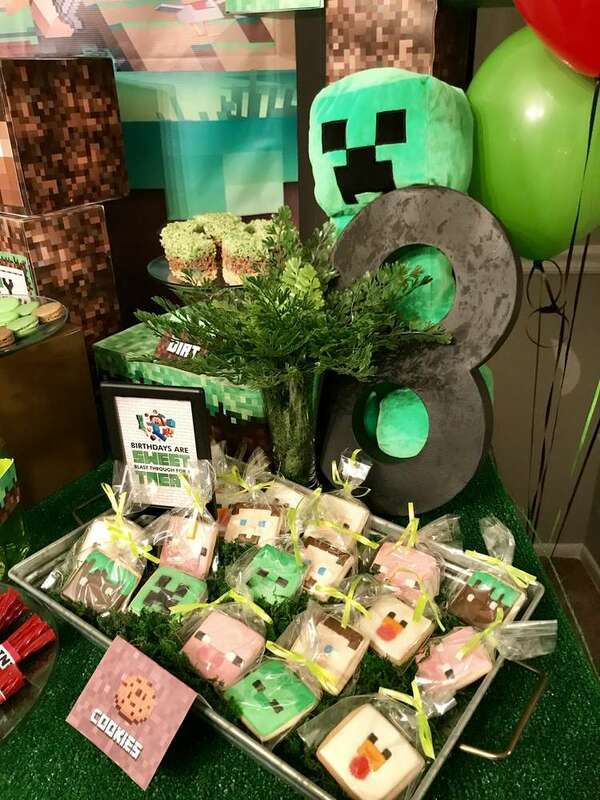 Scroll down for fun food ideas, party planning tips, and LOTS of free printables, to help plan your own Minecraft party. 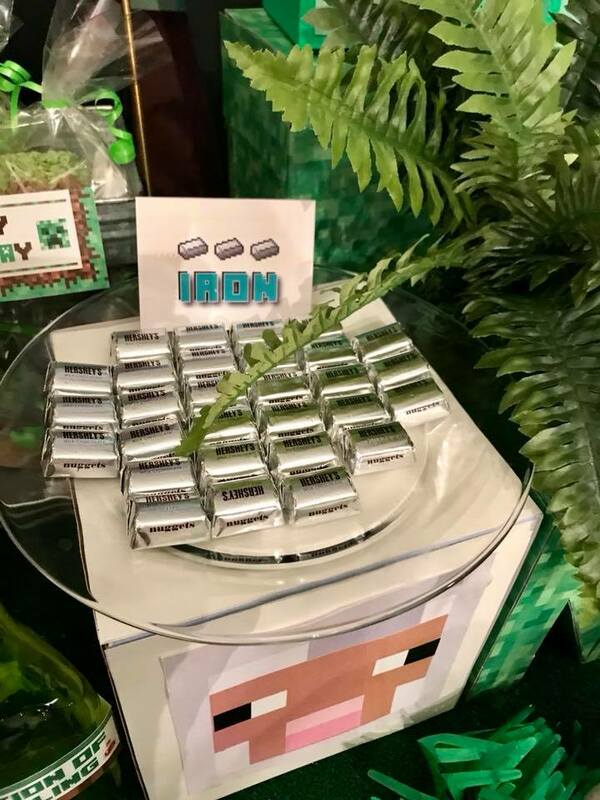 Minecraft party food is beyond easy to put together. The birthday boys mama, got pretty creative serving homemade Beef Brisket, for the "Beef" cards. Other than that, the rest was relatively simple. Perfect for mom's like me, that can't stand slaving away over party food all day. Grab some party food ideas below and the free printable cards here. Grab our 4x6" party sign's PDF by clicking here or the photo below. 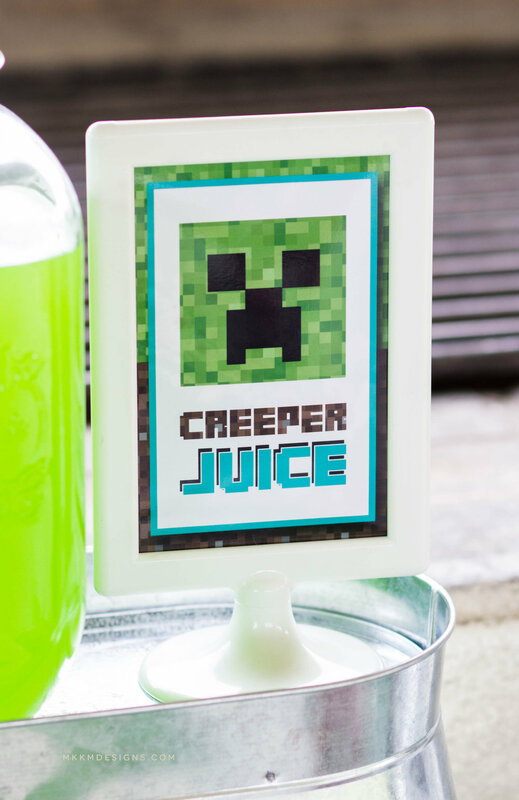 Includes "Thanks for Creeping By", "Birthday are Sweet, Blast Through for a Treat", "Creeper Juice", and not pictured, a "Nether Portal, Do Not Enter" sign. These custom made Minecraft masks MADE the party. With the help of a friend, the Birthday boys mom spent hours making each one. Each kiddo got to go home a mask and bracelet and they looked adorable running around all day as "creepers". There were even bows on some for the girls, (Surprise apparence by me below LOL). The spider balloons that hung over the party table are a super simple DIY. A black balloon, black streamers, and red construction paper. Boom, done. 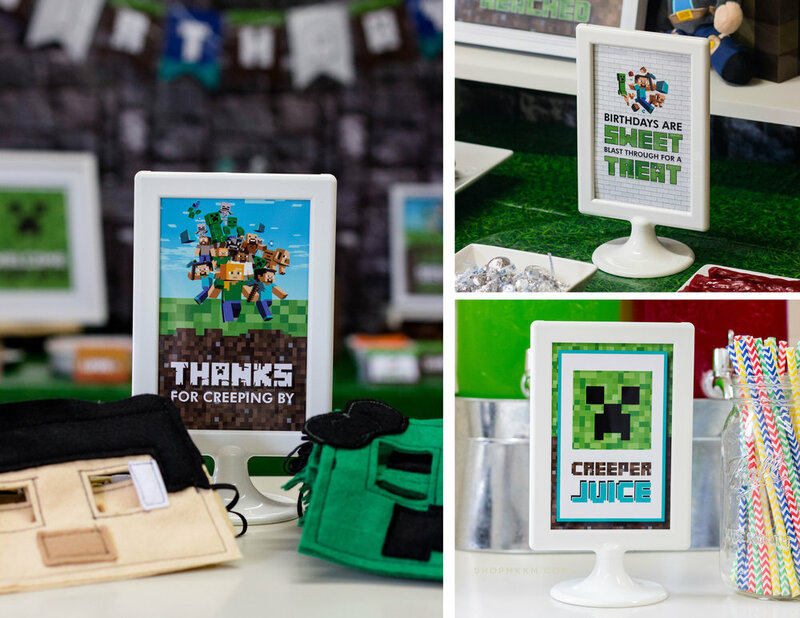 The custom 8x10" "Level Reached" sign is available in our shop! The invitation is now available in our shop! Grab it <here>. 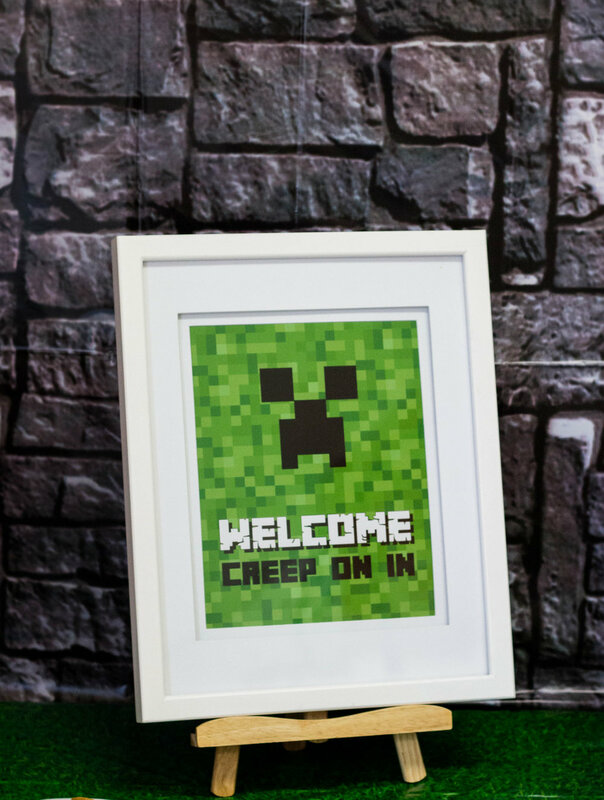 If you'd like any other party signs in a Minecraft theme, or any other customized printables, you can always reach out to us on Etsy to see if we are taking custom requests! Special thanks to Natalie over at Little Miss Party Planner, for sharing some of her party photos using our free printables. Her events are amazing! You can check out more of her work on Facebook, Instagram and Catch My Party. 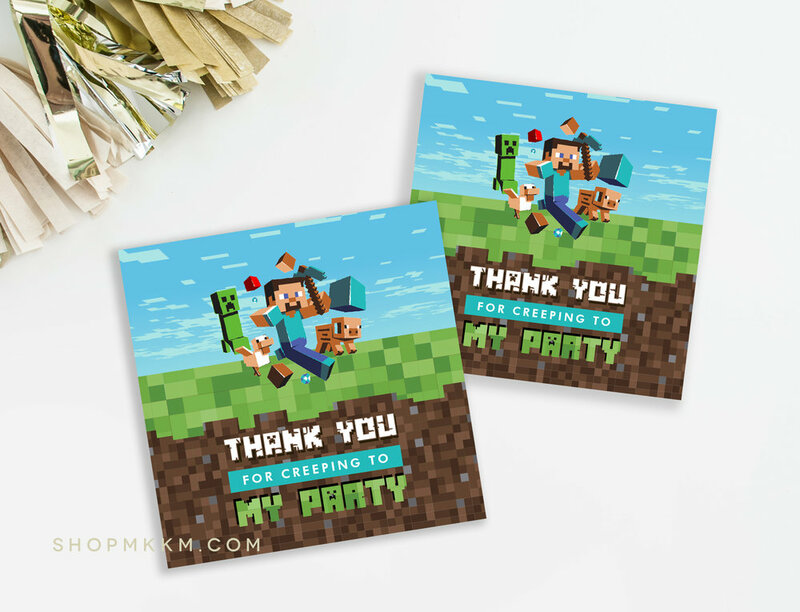 If you liked this party, check out our Super Mario party for other video game themed printables! We LOVE seeing how you used our printables! Be sure to tag us on Facebook and Instagram @Mkkmdesigns. ** This post was originally created in November 2017. New content was added in April 2018.